SAN DIMAS – Powerful water interests and conservative members of cities in Los Angeles County raised numerous concerns Tuesday about proposed legislation that would grant the National Park Service power to manage portions of the foothills, Puente Hills, and San Gabriel and Rio Hondo rivers. While plans to establish a National Recreation Area as a way to funnel more resources for recreation along the rivers and in the Angeles National Forest have been around for 10 years, this marked the first time these groups have publicly listed deep-seated concerns that stopped short of objections. If the federal government were to block off portions of the river, either as a recreation area or as a scenic river designation, it would curtail water supplies to 1.6 million residents in the eastern part of the county, said Tony Zampiello, the executive officer of the Main San Gabriel Basin Watermaster, the court-appointed overseer of groundwater pumping and recharge. Zampiello also spoke on behalf of the San Gabriel Valley Water Association. He said the association has retained an attorney to protect members’ water rights and said new recreation projects along the rivers could require water agencies to make up the loss of recharge water with expensive, imported water from Northern California that would cost $30 million a year. “We have no objection to the designation as long as it doesn’t impact water flows, water rights and water quality,” Zampiello said during a presentation at San Dimas City Hall. He and others spoke at a three-hour informational meeting hosted by the San Gabriel Valley Council of Governments. More than 100 people attended the meeting. An overflow crowd stood in the back even after extra chairs were added to accommodate more people. Since April, the NRA proposal has been losing steam. That’s when the U.S. Department of Interior and National Park Service released its recommendation to Congress for a scaled-down version of a long-proposed National Recreation Area overlaying local wild areas. It would include the San Gabriel Mountain foothills, the river areas south to Pico Rivera and the western Puente Hills but excludes the Angeles National Forest. The recommendation, contained in the final San Gabriel Watershed and Mountains Special Resource Study, advocates an NRA of only about 50,000 acres, one-tenth the size of the 581,500-acre NRA proposed in “Alternative D” that encompassed nearly the entire Angeles National Forest in addition to the rivers and Puente Hills. The larger plan is supported by a majority of residents who attended meetings from 2009 to 2012, 23 Southern California members of Congress, the county Board of Supervisors and the San Gabriel Mountains Forever group, a nonprofit coalition of residents, environmental groups and faith-based groups. At the end of Tuesday’s workshop, San Dimas Councilman Denis Bertone, a longtime regional environmental voice, said the water agencies’ concerns need to be addressed. “The Wilderness Society, the San Gabriel Mountains Forever group have some work to do with the water agencies,” Bertone said. She also called on Rep. Judy Chu, D-Pasadena, to allow local government to help draft the legislation. The proposal “could have more negative unintended consequences to our water rights, our businesses and to our recreation users,” Nelson testified. Chu’s aide Brian Urias told the audience the congresswoman hopes to have a bill in late fall. “Nothing has been drafted yet. You could say the congresswoman is on a listening tour,” Urias said. Rosemead Councilwoman Margaret Clark also expressed concerns about water shortages. She and Nelson agreed that Chu should not combine the issues of a NRA and a scenic river designation into one bill, but preferred separate pieces of legislation. Others in attendance expressed concerns over the federal government taking property and requiring additional regulations for cities and businesses. Belinda Faustinos, who spoke for the Trust for Public Land, said an NRA is not the same thing as a national park. With no federal land, the Park Service would not have any power over land-use decisions, nor would it add a single new regulatory requirement. She said the proposal would bring in rangers, planners and other experts from the NPS to augment recreational sites, such as Pio Pico State Historic Park in Whittier, which is closed 90 percent of the time. “If the park service were to staff this, imagine the possibilities,” she said. One thing all sides agreed on was removing any reference to the Santa Monica Mountains National Recreation Area. A linkage to the Santa Monica Mountains was soundly rejected by most who attended the meeting and by Chu, whose aide said Chu’s legislation would create an independent NRA. Bertone, part of the SGVCOG’s new ad hoc committee on the recreation area, said the committee will develop a report with recommendations to the governing board. Its first meeting is slated for 6:30 p.m. Aug. 12 at El Monte Community Center, 3130 Tyler Ave.
I’m writing a story for the weekend about people choosing to raise chickens in their backyards, which seems to be the result of a perfect storm of recession-induced stinginess and a frenzy for all things organic. Since every city seems to have different poultry policies, this has meant a lot of phone calls on my part today. I was just on the phone with Conal McNamara, Assistant Community Development Director for Azusa, and I found out something very interesting: Azusa residents can keep up to five adult chickens inside their homes if they so choose. You read that correctly – inside. I dunno who would choose to do such a revolting thing, but it actually sounds like less hassle than keeping the chickens outdoors, in which case Azusa has lots of rules about property lines, setbacks and enclosures. A group of Azusa residents who oppose the city’s plans for a four-story Gold Line parking structure behind City Hall are planning a protest rally on Saturday. 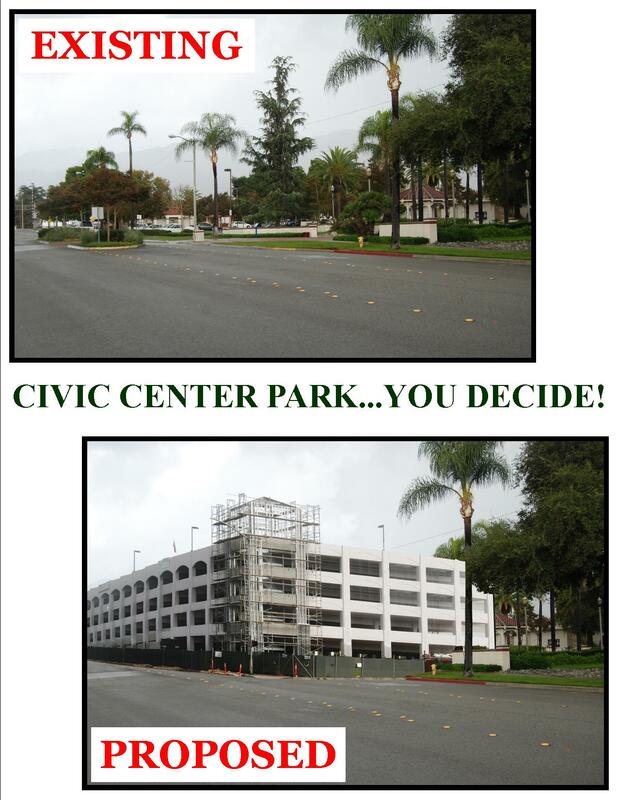 The Save Azusa Civic Center Park Committee (SACCPC), naturally opposes the idea. To show just how ugly the parking structure will be, the group has put together a simulation of what they think it will look like. They photoshopped a picture of an Irwindale parking structure over the park – with remarkably realistic looking results. For those interested in the rally, it will start at Azusa Avenue and Fifth Street on Saturday at 11 a.m. The marchers will head from there to the park for the rally at noon. Mayor Joe Rocha and Azusa Unified School Board Member Yolanda R. Pena may even be there. Azusa’s annual celebrity softball game has brought out the big guns … er swords, um, knives? What category does a machete fall into anyway? Is there a brunch equivalent to knife/sword weaponry? I hate brunch. If it is before noon, it’s breakfast. But I digress. The softball game is at 5 p.m. Sunday at Gladstone Park Field of Dreams. The price of admission is an unwrapped toy worth $5 or more. There will also be some urban rappers on hand. I am going to hold the jokes and let their names speak for themselves. It is a good cause, afterall. The urban rappers: Glasses Malone, Topic, Teck Holmes, Diamonique, Ret One and Paul Renteria. I erroneously reported in the newspaper today the deadline to submit papers to run for Glendora City Council was Monday. I was wrong. I’m sorry. The confusion arose due to the fact the deadline is different for various cities. The difference comes down to this: some cities are open Friday, some are not. For example, Azusa is closed on Fridays so the city’s deadline is Monday. Glendora is open Fridays, so the deadline is this week, instead. One caveat to everything I just said: It is almost a certainty that Glendora’s deadline will be extended. The rule is that if no incumbent applies to be reelected, the deadline to apply for council is extended. In this case, while Ken Herman and Doug Tessitor will most likely run for reelection, Terry Kent most certainly will not. When Kent applied to be appointed to council earlier this year to replace the vacant seat left by Gary Clifford, he vowed not to run. It was a condition the council was looking for in an appointed person. Kent, if he intends to fulfill that promise, would then not seek election to the seat thus forcing an extension of the deadline. The new deadline would be Dec. 15. Applebee’s may soon be coming to Azusa’s neighborhood. Is that who you want? Azusa is near to approving a $200,000 forgivable loan to Applebee’s to entice them into moving into the Citrus Crossing retail center. That “loan” essentially means the restaurant gets to keep $200,000 if they stay in Azusa for more than 5 years. Talking to City Manager Fran Delach, he said Applebee’s was the top choice and come forward first in a group of national chains considered for the spot. The others mentioned were Roadhouse Grill and Buffalo Wild Wings. Knowing that, is Applebee’s the restaurant you would want your city to haul in? Or are the other two choices more mouth watering? I am staying impartial due to my journalist integrity. But I will say that those Buffalo Wild Wings … um… wings are pretty darn tasty. I like the spicy garlic sauce. Traditional style. With a basket of french fries. The way big chain stories are greeted in cities, with all the deals (for residents) and sales tax revenue (for cities), you would think Azusa would be paving Azusa Avenue with gold, or at least rolling it with red carpet for a day. To be honest, I’ll settle for a giant pair of scissors with a ribbon cutting. Classic stuff. Anyway, the official soft opening for Target is today (Tuesday!) from 5 to 6 p.m. The fireworks extravaganza grand opening is Sunday when Target is opening 10 stores on 10/10/10. The store WILL NOT be open Wednesday through Saturday. 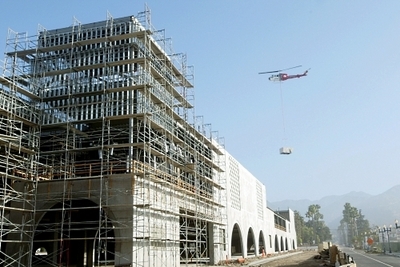 Sensitive to the economy and the housing market crash, the Los Angeles County Board of Supervisors gave the Azusa Rosedale housing project’s developers a four year extension on building a fire station for the community. The developers will have until May 2015 to construct a 6,000 square foot replacement fire station that is contingent on 1,000 homes being sold in the community. Just got off the phone with an officials from Dalia’s Italian Ristorante, which had their grand opening today that featured free pizza for a year to the first 100 customers. Well, since more than 100 people showed up in line, the owner was feeling generous and is apparently handing out the free pizza credit to the additional people above 100. For the people who stood in line, they will get a free pizza every Tuesday for a year. That’s 52 days times 100 people … (drop the zeros, 52 times 1 is 52) so that’s 5,200 pizzas for free. UPDATE: Apparently more than 200 free pizza vouchers were given out, reporter Thomas Himes tells me. That could mean more than 10,000 free pizzas could be given out by Dalia’s in Azusa over the next 52 weeks. I’m not sure Dalia’s Pizza fully understands the implications of what they have done. The restaurant is offering free pizza for a year to its first 100 customers Thursday in celebration of its grand opening. The restaurant opens at 10 a.m.
Let me repeat that: First 100 customers. Thursday (tomorrow). Dalia’s Italian Ristorante. Free Pizza for one year. The restaurant is located at 855 E. Alosta Ave., Azusa. Do they know they have two colleges nearby? This place is going to get trampled to the ground on the first day it opens. The owner, Fadl Fares, is billing the charitable act as a thank you to the city who gave him loan assistance to expand what is normally a small pizza place into a full Italian restaurant. Officials with Dalia’s said they expect people to line up over night for this opportunity. Now all some of those college students need is someone to spot them free beer for the next year and they will be living the life! Wait? APU is a dry campus? Oh…well then. Free pizza with a nice glass of Coca-Cola!